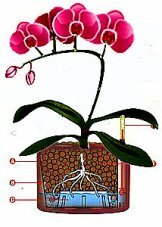 Our hydroponic system is perfect for growing orchids! Beginner or expert, you'll get fantastic results with our system. No more worries about water on the floor! 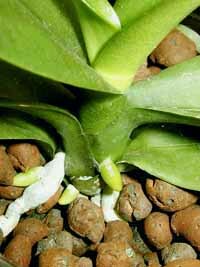 You'll be amazed at how easy growing orchids in hydroponics can be! Hydroponics means growing without soil. There are many types of hydroponic systems on the market today. Most are complicated to use and expensive to buy. 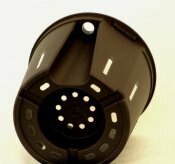 Pumps, motors, electricity, etc..
Our hydroponic system is simple, easy to use, and doesn't cost an arm and a leg to buy. All growing media is replaced with our special clay pebbles called LECA (Lightweight Expanded Clay Aggregate). These man made clay pebbles have capillary properties that wick the nutrient solution up to the plants. No pumps, motors, or electricity needed. Pot Acts as a reservoir holding the nutrient solution for the plant. LECA pebbles are a man made sterile ceramic pebble that "wicks" the nutrient solution up to the plant gently and evenly. Our LECA pebbles are not round, like some on the market. They are irregular in shape and size locking into place and helping to anchor roots. No more guessing about watering! Is the plant too wet ... or too dry? What holds water - what doesn't? Our system has a Water Gauge that tells you when and how much to water. What could be easier? Air vents in the inner (culture) pot are designed to promote maximum air circulation at the roots. The water gauge locks into the pot from the bottom and can even be used as a handle for removing the inner pot from the outer pot. 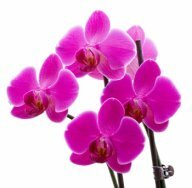 As you go about your busy life your orchids are getting exatcly what they need for optimum growth. 1. Pour water (or nutrient solution) over the pebbles. Water passes through the pebbles to the reservoir at the bottom. Water gauge tells you how much is in the reservoir. 3. As moisture moves up to the roots, air circulates through the open spaces in the culture pot and between the pebbles, giving the roots with an even mix of air and water. What nutrients are your plants actually getting? Complete, balanced nutrition is easy with our system. No more guessing. Just add a few drops of nutrients to the water and your plants will get everything they need for healthy growth and vibrant blooms. No worry about salt buildup either. Simply flush the roots at the sink every couple of months and all the impurities wash away! Healthy plants are easy with correct watering and balanced nutrition. Fewer insect problems- and other plant ailments too! Beginner or expert, your orchids will benefit from our hydroponic system! 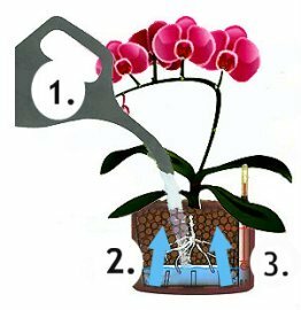 Our "Starter Sets" have everything you'll need to transfer two orchids into hydroponics. Step by step instructions are included. Your orchids are waiting . . . .